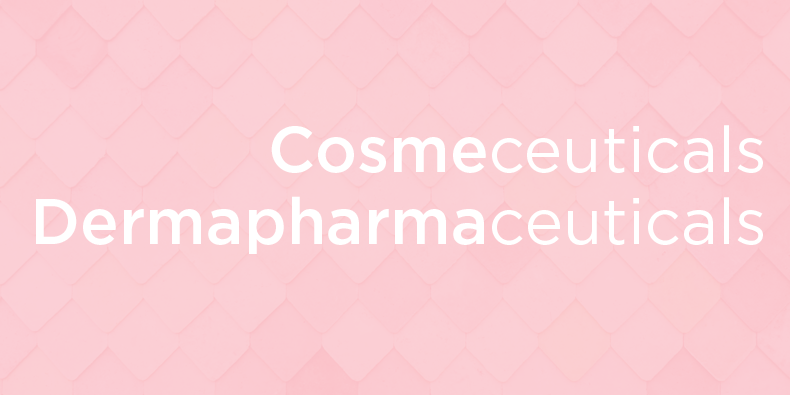 Cosmeceuticals and derma pharmaceuticals. They look like complicated jumbled words that don’t really mean much. Yet the terminologies are used daily by specialists. The products stated above are, just like cosmetics, mainly meant for applying onto the skin. Though not always very significant, there is certainly a difference between them. Cosmetic products: are aimed at cleaning the skin, adorning, protecting or keeping it in good condition. They also help in eliminating body odour or just to make you smell nice. Cosmeceuticals: affect and improve the skin. These work by having a positive influence on the structure or functioning of the skin. So they go a step further than cosmetic products. Derma pharmaceuticals: also known as medicine. These attempt to make a positive and lasting change to the structure or functioning of the skin. The difference between the above definitions? What does this really mean for the effectiveness of, for example, a cream? If you look at them closely there is very little difference between these definitions. You can ask yourself the question if keeping the skin in good condition (cosmetic products) is any different from influencing the structure of the skin (cosmeceuticals). And there is also a fine line between changing (derma pharmaceuticals) and influencing (cosmeceuticals). The complicated terms often overlap each other. There are active ingredients in cosmeceuticals that really do make a difference to the skin (for example a higher concentration of Glycolic Acid). Cosmetic products do not generally contain these ingredients but if they do it is in minimal amounts. The use of medical products, on the other hand, is not a conscious choice as building a proven medical file is costly and takes years to complete. Who decides on the definition of the product? In practice it is mainly the manufacturer who decides in which category a new product is classified. The intended use is specified when submitting a new product or combination of products. Real medicine can sometimes be used, provided it only has a supporting role and is not the main ingredient. Peter Velthuis is the Medical Director and Dermatologist at the Velthuis Clinic. He is writing as my guest blogger. Can you find the answer to your questions on my blog? If not, please don’t hesitate to contact my team, they are happy to help you! For years now I have been delving into cosmetics. I believe in the importance of good skincare but, at the same time, I am shocked by the sense and nonsense within the cosmetics world. You can share in my knowledge about skincare via this blog. Wondering which skin type you have? Do you want to read more about skincare?